Owning a pet entails a lot of financial responsibilities. There's food, vet bills, obedience courses, grooming, toys, pet bed, leashes and other supplies, along with the occasional boarding fee if you can't take your pet with you on vacation. 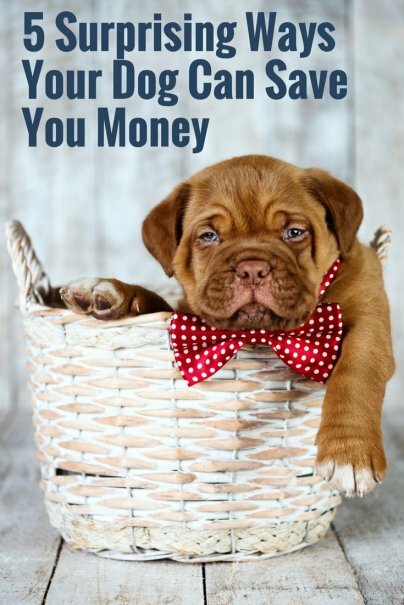 While the intrinsic value of having a pet is difficult to put a dollar amount on (the average annual cost of $580 to $875 of owning a dog, for example), there are financial benefits of having a pet that can be measured. Here are seven ways that pets can help you save money and at least earn some of their upkeep. As I write this, I have a dog sitting patiently at my side, waiting to go on a walk. We will, as soon as I finish writing this story. I walk him at least twice a day for about an hour, giving both of us much needed exercise. What's more, owning a dog has been shown to lower the risk for heart disease. While I can't say if having a dog has resulted in lower medical bills, it has saved me at least $30 a month for a gym membership that I'm less likely to use. Paying to use a gym is a good incentive, but a dog waiting at your side for a few daily walks is a more immediate reason to get moving. If you need a pet as a service dog because you have a medical condition requiring one, it may qualify for a tax deduction. This could include the costs of whatever your service dog needs, including food, grooming, and pet supplies. If your dog is a guard dog or herds sheep on a farm, for example, then the costs of owning that working dog could also be a tax deduction. A guard dog must actually be protecting the company's inventory, and it should be a dog that even you are a little afraid of. As with service dogs, check with your tax professional to make sure your dog is a legitimate tax writeoff. If you're helping an accredited non-profit charity by fostering a dog in your home, then you're entitled to deduct that pet's expenses from your taxes. The downside is you're only keeping the dog for a limited time before it can be adopted by someone else. The upside of fostering a pet is it can be a good way to try out a pet before getting one permanently. And, of course, you're helping both the charity and the animal by opening up your home (and your heart!) to a creature in need. If your dog appears as a show dog or in an agility competition, you may be able to deduct it as a business expense. The IRS will want documented proof that it was a real competition, with a list of expenses. Still not convinced that a pet is worth the price? Here are two easy ways to cut your costs. I don't know when auto sellers changed the term "used cars" to "pre-owned," but they somehow gave used cars a better name and reputation with the name change. Maybe animal shelters should do the same thing. I've always adopted dogs from animal shelters, mainly because I think it's a good thing to save a dog's life. But "pre-owned" dogs are also cheaper at an animal shelter than they would be at a pet store or from a breeder. They're more likely to be mixed breed dogs, making them cheaper, and they're less likely to have the medical problems that are common in some purebreds. However, this doesn't mean you can't find a purebred at an animal shelter, since new animals arrive daily. Along with lower adoption fees, animal shelters also often offer lower spay and neutering fees, along with cheaper vaccinations that new pets need. They may also offer discounted or free vet visits for new pet owners. If you walk your dog often and take it to the dog park where interaction with other dogs is available, you'll likely have a more socialized pet. This can eliminate the cost of hiring a trainer or going to numerous obedience classes. While a few such classes are smart for any new owner, your pet may need more if you don't practice good behavior with them often enough, or if they're just not getting the lessons enough. A well-socialized dog can also save you money by showing your friends what a well-behaved dog you have so they can dog-sit your pet for free when you go on vacation. If those financial benefits aren't enough reasons to own a pet, then consider the unconditional love you'll get by taking care of a pet. You can't put a price on that. Do you have a dog or other pet? How has your animal companion save you money? We just recently got our first dog, Oscar, from a no-kill shelter, and a way we are saving money with him in our family is we have been eating out less and doing fewer things that keep us away from home (movies, long shopping trips). We find that we want to spend more time at home with our furry friend than doing things away from him which, consequently, waste dollars. Also, I have to say, the non-monetary benefits of owning a dog are immeasurable. That's not what this post is about, but it's not for nothing. We love our little guy to pieces and he brings so much joy to our lives! #3. As a professional dog trainer and handler, I must take issue with #3. It is clear you have never owned a "guard dog" as you call it. You should never, ever have a dog that "even you are a little afraid of." That is ridiculous. PLEASE, do not get any dog without learning from a professional how to train your dog. If you aren't willing or able to do this, for your own sake, the sake of your family and friends, and mostly, for the sake of the dog, DO NOT GET ONE! Since this column is about saving money, I'll point out that the liability issues of having a dog you are afraid of is massive. I hope no one will use this ill-informed and poorly-researched point to get a dog, thinking they'll have a tax break. I think people who have pets, should be willing to take on the costs that come with having a dog or cat. If your out to save money with tax exempts or stuff like that then maybe a pet is really something you should not be getting. A pet is about having companionship not about saving money.